A professor of environmental science has sounded a warning over development plans for Cloghan Point ahead of a public meeting next month. Geraint Ellis, a resident of Rawbrae Road, has outlined his concerns for Belfast Lough which would see the arrival of international oil tankers. A planning application is currently being considered by Mid and East Antrim Council for the redevelopment of the existing terminal, which has been operational since 1979, to an import, storage and distribution facility, incorporating petrol, gas oil and diesel. Prof. Ellis said be believes that this could present a “major risk to marine life” at Belfast Lough, a Special Protection Area. He also highlighted worries locally of the proximity of storage tanks to the railway. 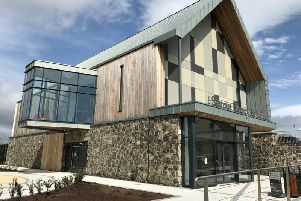 Concerned residents are due to meet with representatives of the company behind the development, Cookstown based LCC Group, at Whitehead Community Centre, on April 17. The company says it is “committed to continued consultation during the planning application submission phase with both the regulatory bodies and local residents”.